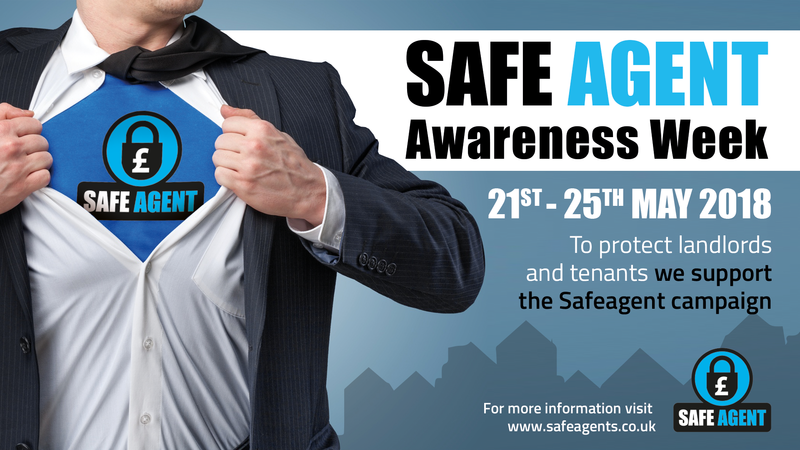 Over 3,000 professional lettings agents across the UK will unite for SAFEagent Awareness Week 21-25 May 2018. Now in its seventh year, SAFEagent Awareness Week will remind tenants and landlords to always choose a professional agent who is part of a Client Money Protection (CMP) Scheme run by a regulatory organisation. Recently Government announced new measures on protecting the consumer and mandatory CMP for all letting and managing agents. These included the legal requirement for all letting agents to be part of a CMP scheme and civil penalties of up to £30,000 for those who fail to comply with the scheme. While the plan to make all agents covered by CMP schemes is a huge victory for the SAFEagent campaign, it has still not come into force and will not do so until 1 April 2019 meaning consumers’ money is at risk if their chosen agent does not have client money protection. SAFEagent Awareness Week 2018 will remind consumers that SAFEagents are well ahead of the game with CMP in place now and already adhering to this requirement. “SAFEagent’s original aim -to make it mandatory for all agents be part of a client money protection scheme is finally close to becoming reality. Over the past seven years the agents who got behind the SAFEagent campaign have been instrumental in getting us to this stage. They should quite rightly be proud they have been the standard bearers for this important protection for tenants and landlords’ money. “Unfortunately, this law still isn’t in place. That’s why we’ll continue to raise awareness with consumers, reminding them to vote with their feet, and only use an agent who can offer them financial protection now.